An important part of the Key School at Carolina Day experience is the innovative "Talents" program. Students may enroll in a "special interest" class each semester. 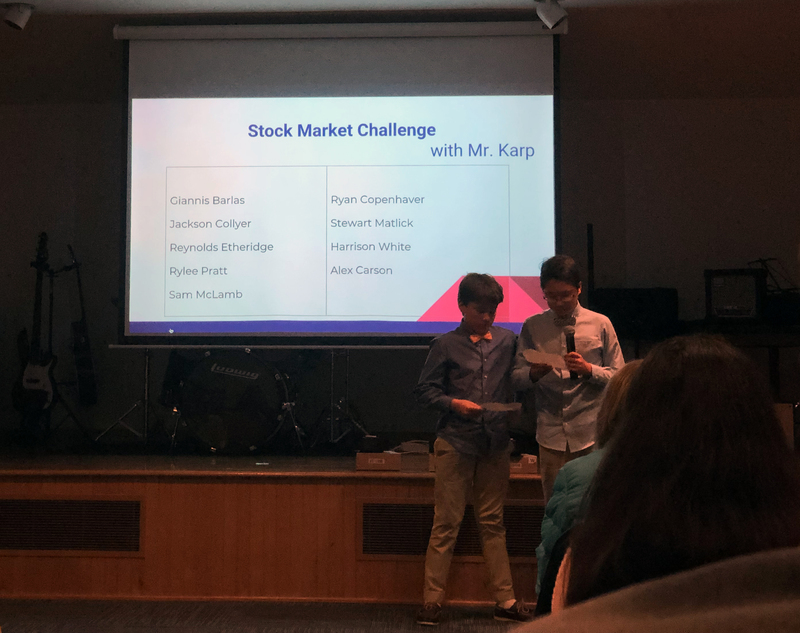 Among the many offered this semester—including criminology, origami, leadership, and chess—is a new class called the "Stock Market Challenge," led by Michael Karp, KS7 math and reading comp teacher. "We use an app that allows us to simulate purchases as if buying from NASDAQ or the New York Stock Exchange itself," says Michael. "Then we pull up the live tickers on these different stocks, analyzing how they progress on a graph. It's challenging and fun, because the students are actually researching and making predictions on these real-life companies. We also ask the key question: What are the types of things that affect a company's stock over time? The students are super into it; they come in every morning with questions like this one recently, "Mr. Karp, did you see how Apple fell 5% last night?!'" Students who participated in the class presented their learning and work to peers and parents as part of the Talents celebration last week.